One hundred years ago, Robert Falcon Scott and Roald Amundsen were racing to claim the last great geographic prize, the South Pole. It was an epic battle, a life or death struggle. Now, a century later, Kevin and Jamie know how they feel. The Hot Polish Girl (HPG) is starting to get clucky. Kate is back in the picture. Their carefree bachelor days are numbered. There is only one solution. They set themselves the challenge of trekking, unsupported 2400kms from the Antarctic coast to South Pole and back across the coldest, windiest, highest, driest, most 'est' place on Earth. Along the way they experience abyss-like crevasses, tooth-cracking cold, fickle GPSs and skin-melting frostbite. They are ravaged by auto-cannibalism, attacked by white ninjas and meet girls in bikinis. Through their adventures they unravel the mysteries around Captain Scott's last expedition. 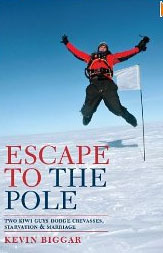 Written in the same whimsical, entertaining style as 'The Oarsome Adventures of a Fat Boy Rower', 'Race to the Pole' puts a modern human face on a classic adventure story.